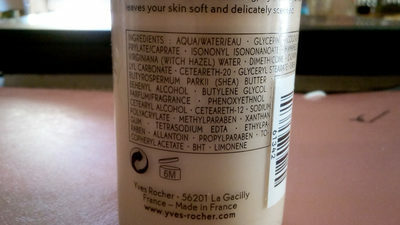 EAU, GLYCERIN, COCO-CAPRYLATE/CAPRATE, ISONONYL ISONONANOATE, HAMAMELIS VIRGINIANA (WITCH HAZEL) WATER, DIMETHICONE, DICAPRYLYL CARBONATE, CETEARETH-20, GLYCERYL STEARATE, UREA, BUTYROSPERMUM PARKII (SHEA) BUTTER, BEHENYL ALCOHOL, BUTYLENE GLYCOL, PARFUM/FRAGRANCE, PHENOXYETHANOL, CETEARYL ALCOHOL, CETEARETH-12, SODIUM POLYACRYLATE, METHYLPARABEN, XANTHAN GUM, TETRASODIUM EDTA, ETHYLPARABEN, ALLANTOIN, PROPYLPARABEN, TOCOPHERYL ACETATE, BHT, LIMONENE. Product added on December 29, 2016 at 7:32:45 PM CET by kipaul666. Last edit of product page on April 26, 2018 at 2:15:04 PM CEST by tacite.